The Los Angeles Chargers activated Denzel Perryman from the Reserve/Injured-Designated for Return list Tuesday. The third-year linebacker missed the first half of the 2017 season with an ankle injury. Chargers head coach Anthony Lynn told reporters that Perryman would “likely play” in his team’s upcoming game against the Jacksonville Jaguars. 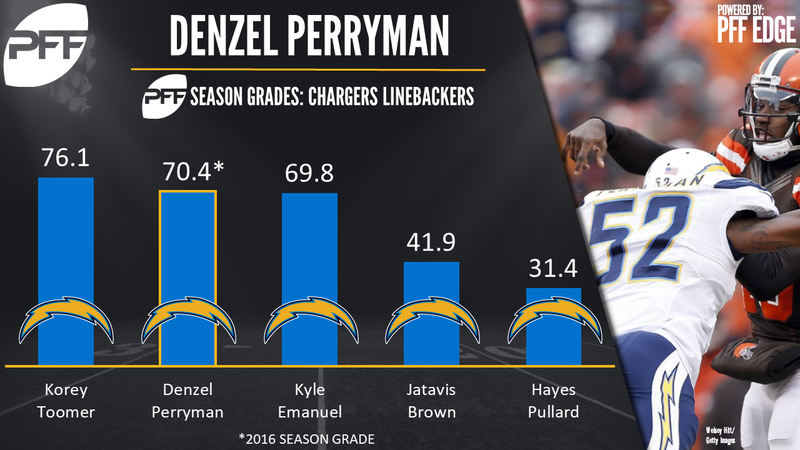 Perryman was a second-round pick of the Chargers in 2015 and had an immediate impact in his rookie year; his overall grade of 82.4 ranked 15th at his position. He was particularly impressive against the run, achieving the top run-stop percentage among all linebackers of 18.3 percent. While he couldn’t match this elite production in his sophomore season, his run-stop percentage of 9.4 percent did remain among the top 20 inside linebackers in 2016. He also made an improvement defending the pass, going from 1.13 yards per coverage snap allowed as a rookie, to 0.96 in his second year. The coming weeks will likely see Perryman take snaps from current starter Hayes Pullard, who has achieved a season grade of just 31.4 so far in 2017, which ranks last among linebackers.